Joe Sehwani is on a mission to create a better life for the visually impaired; one that is more accessible and more open than ever before. And he’s inviting those with a passion for the cause to join him through his nonprofit called the Dreamscape Foundation. Perks: Dreamscape Foundation will send you a branded t-shirt for donating to the Tik Tak charity stream. Perks: Dreamscape Foundation will send you a branded t-shirt for donating to the Tik Tak charity stream and get entered to win a copy of "Warner Bros Fortnite: Deep Freeze Bundle". Perks: Dreamscape Foundation will send you two branded t-shirt for donating to the Tik Tak charity stream, get entered to win a copy of "Fortnite - Deluxe Founder's Pack", and receive a shoutout on Dreamscape's Twitter! Kenny and Justin Jongsma were your everyday young adults until a rare disease transformed everything at the age of 21. Called Leber Hereditary Ocular Neuropathy, or LHON, it robbed them of their central vision over the course of a few months. In many ways, their lives came to a screeching halt as they lost their independence, the ability to enjoy their hobbies, and in Kenny’s case even his job. Since then, it’s been an uphill battle learning how to adapt to their new disability. Yet there’s a device on the market that offers a beacon of hope for independence redeemed. It’s called eSight Eyewear, and it gives the brothers the ability to see the world around them again with nearly 20/20 vision. However, they don’t come cheap. One set costs $9,500. While the company goes above and beyond to help their users afford the technology, Justin and Kenny needed a little extra assistance. 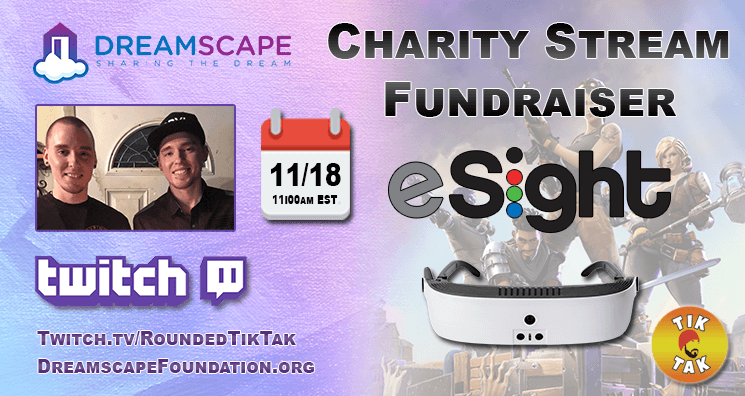 In order to help reach the Jongsma brothers’ financial goal, Dreamscape Foundation is teaming up with Fortnite streamer TikTak on November 18 for a Twitch-based charity stream. This isn’t the first time TikTak has streamed for a charitable cost. In the past, he held an event raising funds for the Music for Relief Foundation, an organization born by Linkin Park. The event blew past its goal by nearly $900. Now he hopes to do the same for Kenny and Justin. During the stream, TikTak will be playing Fortnite and promoting giveaways and contest entries based on 3 donation tiers: $10, $20, and $50. Each tier offers a unique bundle, and participants can donate multiple times if they want more than one. Donations of $20: Dreamscape Foundation will send you a branded t-shirt for your donation and enter you to win a copy of “Warner Bros Fortnite: Deep Freeze Bundle”. Donations of $50: Dreamscape Foundation will send you two branded t-shirts for your donation, plus entry into a drawing to win “Fortnite - Deluxe Founder’s Pack” and a Twitter shoutout from Dreamscape. One hundred percent of all donations will go directly toward paying for eSight Eyewear for Justin and Kenny Jongsma.